The competition was judged by leading authors Jackie Kay, the Scots Makar (poet laureate), Blake Morrison, writer and Professor of Creative and Life Writing at Goldsmiths College and Jon Canter, Suffolk-based novelist and playwright. At an event at the FlipSide Festival at Snape Maltings on Saturday October 7th, Jackie Kay announced the winners and presented the winners with their cash prizes: £500 for the adult winner and £250 for the Under 16 winner. The adult category was won by Grace Blackwood with ‘S for Survival’, a post-apocalyptic instruction manual for regenerating the world’s flora. Second prize was awarded to T.J. Marshall-Nichols for ‘Queuing at Yoshinogawa’ and third prize to Diane Jackman for ‘The Naming of Flowers’. Grace Blackwood writes short stories in between working for a children's literacy charity and bringing up three sons. She has had work performed at the Liar's League and published in the London Journal of Fiction. She lives in South London but spends as much time as possible on small Scottish islands. In the Under-16s category, the winner was Dhylan Patel for ‘The X Animal Museum’. Second prize was awarded to ‘Ice Caps’ by Iona Mandal and third prize to ‘The Tale of the Carrot Tree’ by Amelie Meek. 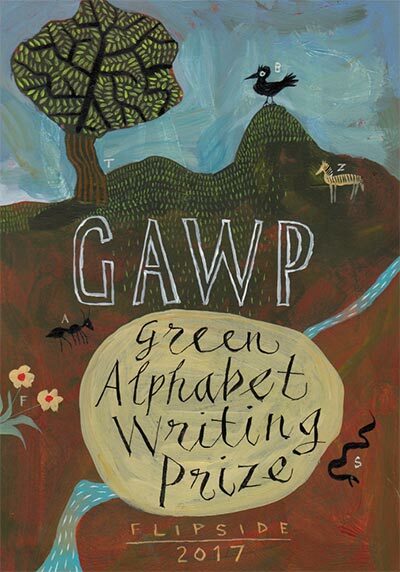 Writers were asked to submit fiction, non-fiction or poetry with a green theme and to take just one letter of the alphabet as their starting point. GAWP was run in conjunction with Friends of the Earth.